Have you ever lost socks? I know I have. This is especially likely to happen with lots of kids, it seems. 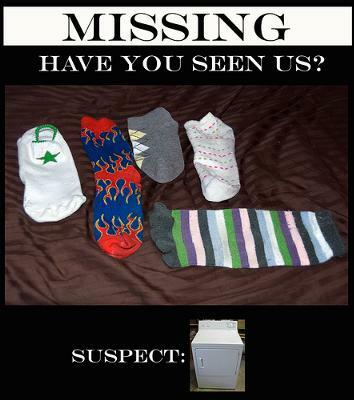 LL has a great suggestion for everyone for keeping those socks from going missing. I have 4 boys...that's right FOUR BOYS! We have many, many, MANY socks. Something always gets lost in the washer-monster. It is a pain to wash, dry, separate, pair up and fold up hundreds of socks. Then, there is the hassle of trying to locate a missing sock, finally putting the lone sock to rest....only to find it's mate mysteriously appear days later. I use 1 kind of sock for each boy. There are no colored socks, we use all white. Then, when the socks are dirty, they are put into a mesh laundry bag (one per child). The bag is zipped and thrown into the laundry. Once finished, each boy takes his own bag, containing his own socks, to his dresser. There is no sorting and separating. They are contained in the bag or they are on feet....they are not floating around somewhere. I take socks off my feet and immediately put on the ring which holds pairs together through the washer and dryer. I put sock pairs into my drawer with the ring on and it only comes off when I am about to put them on my feet again. I haven't sorted my socks in YEARS!!!! My kids haven't learned to use the sock-locks...stubborn preteens. LOL. They are old enough to sort their own socks...if they don't, it becomes "mismatch day". Join in and write your own page! It's easy to do. How? Simply click here to return to Home Management Tips.